Arrested at the Custom House, Christy had not been out for the Easter Rising but was very heavily involved in the War of Independence and also served in the Civil War. His BMH Witness Statement describes ASU successes, frustrations, failures, close shaves, plus a few anecdotes – and more. For those who have not read that, it is well worth a browse. Christopher Fitzsimons was the 3rd child for Patrick, a General Labourer and Sailor’s son from Baldoyle and his wife Jane née Fagan originally from Rush, Co Dublin. Christy, named after his maternal grandfather, arrived on 21 July 1900 at his parent’s north inner Dublin City home, 9 Stafford Street, since renamed for Theobald Wolfe Tone, born at no. 44 in 1763. By 1909 they had moved to no. 2 Newcomen Court, a small side street which used to run off North Strand Road near the Railway Bridge. The Fitzsimons had 8 children, all but one surviving, and remained living there for many years. The teenaged Christy was probably too young to take part in 1916 but his older brother John was out with B Coy, 3rd Battalion, Dublin Brigade. Christy says he joined F Coy of 2nd Battalion early in 1917 and later that year was sworn into the Thomas Clarke Circle of the IRB. It was appropriate for a young man born on the same street as the famed revolutionary Tone; and, who knows, maybe that had inspired his political views? He recalled a debate at one meeting over admitting Kevin Barry, due to his youth – at that stage Christy himself was not yet 18! Fitzsimons joined ASU No. 2 Section early in December 1920. His high profile with the ASU is highlighted by Sean Prendergast (BMH WS0755): “Concerning the personnel of the ASU, a brief summary of some of their names may be permissible. They were drawn from the various Dublin Battalions and comprised quite a good number of men of our 1st Battalion, like Frank Flood of “H” Company, Paddy and Seán Doyle of “F’, Bernard Ryan of “F”, Christy Fitzsimons, Tom Flood and Tommy Bryan of the 2nd Battalion to mention but a few. Exalted company. Of the men named, only Fitzsimons and Tom Flood survived the Tan War. But both were captured at the Burning on 25 May 1921. Christy’s WS gives a great insight into how the ASU operated and an excellent overview of the many actions he took part in. However, rather than re-hashing them all here, we can look at two – an ambush on a military staff car in January 1921; and the shooting of a policeman in April. 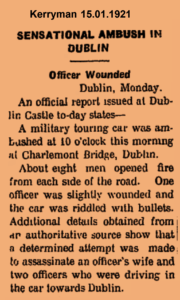 “ASU attack on General Tudor’s Car: One of my first engagements with the Active Service Unit was an attack on the car of General Tudor at Charlemont Street Bridge, early in January, 1921. Frank Flood knew beforehand that the car was expected at Charlemont Bridge at a certain time in or around 10 a.m. Four of us took up positions at McQuilian’s public house at the junction of the canal and Charlemont Street. Frank Flood was on Charlemont Bridge, opposite me. Christy Fitzsimons was in a shop on the corner of Charlemont Mall and Sean Sliney was positioned near a G.H.Q. Intelligence Officer that accompanied us on the crown of the bridge. After about 10 minutes delay I heard a shot fired at touring car by the late Frank Flood. The car headed towards me, turning towards the canal and I opened fire on it. Simultaneously the other two men opened fire on it. The driver swung his car left, and right away from me, upsetting a milk van. I fired again into the car and kept on firing as I followed it. I cannot say who was in the car. I saw two passengers in the back; one was a tall gentleman and the other was a tall lady. Neither can I say if we caused any casualties.” [The British admitted one officer was slightly wounded]. That attack did happen on 10 January but the target was not actually ‘Black Tudor’ (Lt. Gen. Sir Henry H. Tudor KCB, CMG, self-styled ‘Chief of Police’ commanding the DMP, RIC, Tan and Auxies). The officer involved was one of his staff, Head of the Raids Bureau Maj. Geoffrey N. Fitzjohn. So say James Francis Hughes, the GHQ IO at the scene (BMHWS0535); and George White, ASU (BMHWS0956). The lady in the car was definitely not Fitzjohn’s wife anyway, he was not married at that stage. 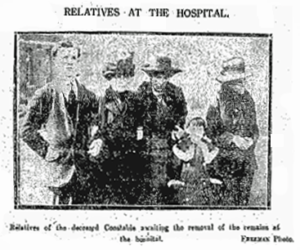 Another fascinating possibility, according to a report in the English Grantham Journal (15 Jan 1921), “the lady was an important witness against the men who murdered the officers in Dublin on Black Sunday” – In Ireland, known as Bloody Sunday. [Thanks to Peter McGoldrick]. Christy was also in two more spectacular ASU daylight gun and grenade attacks in central Dublin on Auxy patrols at Bachelor’s Walk (12 January) and Beresford Place (4 April) before we come to an assassination on 21 April – close to Christy’s original home. His memory, after 30 years, can be compared with the contents of the military inquiry file, including a contemporary plan showing relevant details and locations. No eye-witnesses to the shooting came forward. But, as Christy said, the victim did live long enough to tell his story to police. The dead man was William Thomas Steadman (sometimes Stedmand), a Constable in the DMP. He was born on 5 October 1887, to George Steadman (a Herdsman) and his wife Luisa Ismena (née Gillies) of Cooperstown, Gorey, Co Wexford. 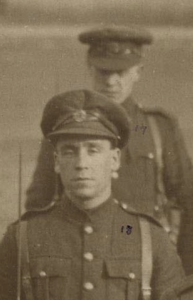 After some time working as an Asylum Attendant he joined the DMP on 16 December 1909, being posted to D Division. He was aged 22 and stood 6 ft. 1⅜ ins. (186 cm) tall. On 24 December 1920 he was transferred to B Division, which was to prove fatal a few months later. It is most probable the “tall man, 6 foot high” described by Const. Steadman as firing the first shot was Tom Flood, Christy’s Section Leader with him in the frontline of the shooting. Like most DMP, Steadman was tall himself. But Flood as a six foot two civilian really stood out in those times. Inspr Haugh added the deceased was a DMP despatch rider at the Castle; was doing a round of ordinary deliveries to various DMP stations when attacked; wore plain clothes; and left the Castle daily about 5pm. His despatches were not taken by the attackers. DMP Sergt. Timothy Sullivan 14C also spoke to his colleague in hospital and heard a similar account with the addition that the victim believed he was hit when falling off his skidding motorbike. Sullivan examined the scene in Mary St and saw 3 bullet marks in the windows of two shops there. Two of the civilians who helped Const. Steadman to hospital gave evidence of hearing 5 or 6 shots at about twenty to six and discovering the victim lying beneath his motorbike at the Mary St-Jervis St junction. Neither saw the incident. One said the policeman complained of shoulder wounds and the other recounted the shot man saying he was badly hurt. Another policeman, Const Eugene O’Neill was on duty at the next junction (Mary St-Liffey Street). and reported hearing up to 6 gunshots. The ASU party got away safely, the only casualty was their target. Later in KGV Military Hospital (now St Bricin’s) a military surgeon found Const Steadman had two bullet wounds in the back of his right shoulder and lung damage. His condition worsened and he died on the operating table in the afternoon of 27 April. William Steadman was unmarried and survived by his mother, two sisters and a brother. 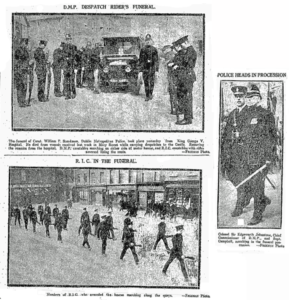 The funeral procession though Dublin involved DMP and RIC contingents including the heads of both police forces. His body was taken to Enniscorthy, Co Wexford for burial. The accounts tally remarkable well, except for the time of the shooting. It shows not all Witness Statements are full of major inaccuracies, tall tales of bravado or distorted by hindsight. Many of Fitzsimons’ exploits are corroborated or added to in other Witness Statements; and events he describes were also reported in the newspapers. Christy was one of the men arrested by the Auxies and given ‘special hospitality’ in Dublin Castle before transfer to Kilmainham. The last two pages of his WS provide the most graphic and clearest account of their treatment after arrest. He also claims that if the Truce had broken down or the British not respected its terms, at least 83 of them in Kilmainham would have faced death sentences. On 11 July, the day the Truce was to commence, their jailers tried to serve Charge Sheets on the internees which they would not accept. Being recognised as POWs from that date must have come as a huge relief to the men and their families. Afterwards, their treatment became less harsh and the prison regime relaxed as the year wore on. 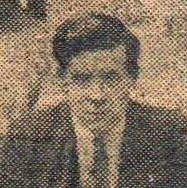 Fitzsimons appears in one photo taken during captivity, below. 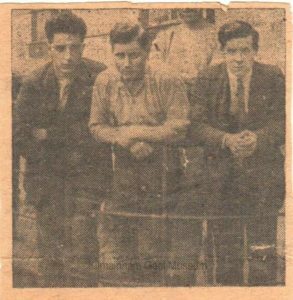 Christy (r) beside Frank Bolster, with Cyril Daly. Courtesy of Kilmainham Gaol Archive via Gary Deering (19PC-1A54-10). He and the rest of Custom House Fire Brigade were released on 8 December 1921. He went back to his unit and was based at Celbridge Workhouse with others from the ASU and Squad until officially enlisting in the Dublin Guard at Beggars Bush, on 4 February 1922. Christy is in the rear rank of the famous photo taken at the barracks that day, marked 17 in the close-up. Lieutenant ‘Fitzsimmons’ was still based at the ‘Bush that November when the Army Census was taken. He took time out the following year to get married on 4 April at Berkeley Road Church to Ellen ‘Nellie’ Deegan from Lower Dorset Street, in Dublin’s North inner city. The marriage record shows him as Saighdiúr [soldier], Beggars Bush Barracks and aged 22. That same month he was made O/C, C Coy, 1st Battalion in Kehoe Barracks, where his commanding officer was Vinny Byrne. Christy’s brothers John, the 1916 veteran, and Patrick also served in the National Army. After the Rising John had worked as an engine room greaser on Transatlantic liners for several years. In early 1922 he enlisted in the new army and became Sergeant 56564 attached to the Dublin Guards, 2nd Eastern Division at Wellington (later Griffith) Barracks. Like his comrades, he was thrown into combat a few months later, but his role was cut very short. Just over a week after the taking of the Four Courts John was dead from a bullet wound to the head, reportedly in an ambush at Francis St on 5 July. The real story was possibly more tragic. A Coroner’s Inquest found he was actually killed when a gun he was handling went off accidentally. John Fitzsimons was one of too many new recruits who suffered a similar fate. His parents later received a military dependant’s allowance. The youngest brother Patrick, along with Christy, managed to survive the conflict. After leaving the Army in 1924 at the rank of Captain, Christy went back to his old locality Dublin’s North Strand, where he and his wife lived at St Bridget’s Avenue, raising a son and three daughters. He worked for the Department of Posts and Telegraphs in Amiens Street Sorting Office and then in the GPO. During the 1950’s the Fitzsimons moved out to the growing suburb of Finglas East. 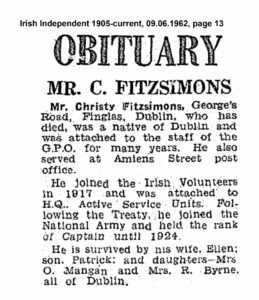 It was there on 3 June 1962 that Christopher Fitzsimons passed away at home aged 62, survived by his widow Nellie, his adult children, grandchildren and siblings. Christopher Fitzsimons was buried in Plot Q101 of Balgriffin Cemetery (near Portmarnock in North Co Dublin). His wife of almost 40 years joined him there not long afterwards, in 1964.